After years of consulting brands and entrepreneurs, I’ve heard lots of requests to make branding easier to understand. When I say, “Branding is your reputation, your interactions with every customer, how people think and feel about you, and the culmination of the experiences that your logo and identity invoke” you could imagine the response. How do you “brand” then? Before you can set up your brand strategy, you need to know where you desire to go. You would have to know your aims and goals ahead. You would have to have a fantastic product or service that speaks for itself. You would have to really care about the impact you make on your customers and really look to make their lives better. Then you could create your strategy. To “brand” in the most positive way, you must be able to visualize your future direction. Branding is actually the action of creating the direction and strategy. A great strategy will trigger a planned (positive) emotional response in a specific audience. That response has been planned and designed by founders with a single vision. It’s no coincidence that when you sip on a Coke, you feel more pride-filled and refreshed. And consequently, you feel more American. They’ve been advertising to you and training you (as the consumer) for over 100 years to feel that way towards their brand. Or that you feel loved when your special someone gives you a diamond. Previous to the 20th century, diamonds were just an ordinary gem. Diamonds were completely disassociated with weddings, love and commitment until the 1930s. Debeers (the well known U.S. jewelers) ran successful advertising through the century to train the market to actually want the surplus of diamonds that they mined. They actually branded diamonds to represent “love.” In effect, they sold loads more of the precious gems. 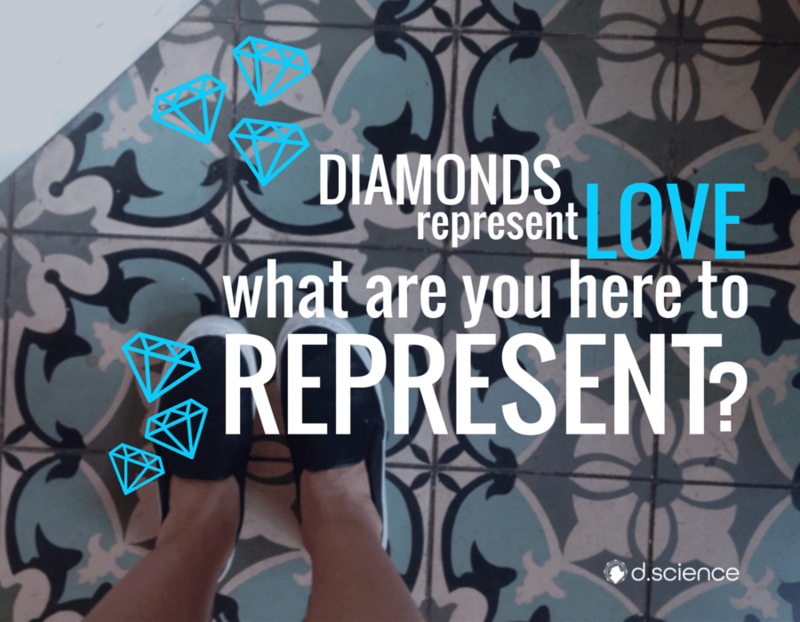 The feeling of love in association with diamonds, or pride and refreshment with Coke, are the emotional responses the brands created. They are strong emotions that can be triggered by the brands themselves. In theory, seeing the Coke logo would elicit an emotional response. The logo itself represents the brand as a whole. People buy on emotion and rarely on logic. I’m sure with those examples you could understand why brands invest so heavily in creating emotional triggers in their market (branding). We don’t need a Coca-Cola but we do need to feel refreshed on a hot summer day. Logically, we don’t need a hunk of coal that through time and pressure was built into a sparkly gem. But, we do need to feel loved. We can obviously feel all these emotions without the objects. The soda, the diamond, and the brands are just shortcuts to these feelings. We’ve given tremendous cultural value to the brand of “diamonds” over the last century. People want to love and feel more love, so they buy diamonds. They gladly give and receive love without the gems. The diamonds just give a quantifiable “amount” to which someone loves. The rocks facilitate a shortcut to the experience of feeling loved. Hence, the multi billion dollar diamond industry. Why build a brand strategy template? A brand strategy is a template that sets goals, expectations, promises and positioning. It’s there to keep everyone in your organization on the same page and on direction. The template sparks discussion and helps your brand become a well-oiled machine. Compare your brand to a group of friends that want to drive across the country. Your brand strategy would be the roadmap and plan to travel from New York City to San Francisco. Your roadmap would outline where you desire to travel, what roads to take, your sightseeing stops, where to rest, and where to take bathroom breaks. In the case of a business or brand, your strategy does the following: sets the goals, benchmarks, major milestones, the company’s approach, positioning, who you’re selling too, and why. Referring to your strategy will keep your messaging consistent across all platforms. This template is your roadmap to success. How to build a brand strategy template. It’s simple. Download our pre-designed and formatted template. Plug in your answers and spark discussion with your team. What’s in a Brand Strategy Template? Whether you’re a solo-entrepreneur or a big brand, you should have a brand strategy. Your strategy there for you to refer to often and help you make pertinent decisions along the way to building your brand. We actually created a free brand strategy template and video training for you to download. You can review the terms and plug the corresponding answers into the template. The template is interactive too, so you can do it all on your computer. If you’re looking to dive deep, and sync your messaging and marketing efforts download the branding training. Grab the Branding Guide: template workbook and video training, here. Build your personal brand + connect with more people. We created a self-paced, do-it-yourself personal branding e-course. The Branding Blueprint goes through the d.science secret formula for branding that has gained our clients over 2 million dollars in revenue. If you’re looking to step it up, but don’t know how this is a great place for you to start. There are a dozen interactive ebooks and over 200 pages of content to go through and complete at your own pace. Did you enjoy the article? Have a better idea of what branding is? Let me know your thoughts in the comments!